Tim Stanford has been selling real estate since 1986, and he has never been more excited. When Tim sold Yocum Realty to Superior, he knew it would take the company to a whole new level. Initially a teacher, Tim sees each real estate transaction as a client education process. Tim’s favorite part about being a realtor is helping the Superior Plus Realtors fulfill their clients’ real estate dreams. After teaching and before his real estate career, he and his beautiful wife Tami moved to San Francisco, where he sold art in a prestigious gallery. For Tim, inspiring people to buy real estate is like the creative passion of an artist. 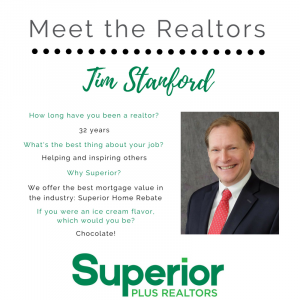 Tim believes Superior is so much more than just another real estate company because Superior offers customers the best mortgage value proposition in the industry: Superior Home Rebate , which delivers outstanding title services, along with a full line of homeowner’s casualty and liability insurance. Tim is committed to bringing the credit union’s member-centric service model, not only to our clients but our agents as well. Karaoke song: Thunder Road by Bruce Springsteen and the E Street Band.